Jillian focuses her practice on the acquisition, disposition, leasing, development, and financing of commercial real estate. She represents both public and private clients, including national and regional developers, life science companies, investors, startups, municipalities, and government agencies. Her experience includes representing clients in negotiating retail, office, and laboratory leases, the acquisition and disposition of commercial and industrial properties, and the development of commercial and mixed-use projects, including advising on issues such as title, zoning, land use, subdivision, and permitting. 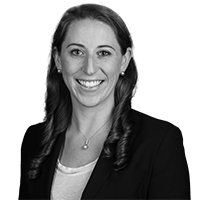 Jillian also advises municipal clients on various real estate matters, including procurement, easements, restrictions, eminent domain takings, licenses, and leases. During law school, Jillian pursued civil rights claims with the Tulane Civil Litigation Clinic, served as a judicial clerk for the Louisiana Fifth Circuit Court of Appeals and for the Massachusetts Superior Court. She has also interned for the Department of Consumer Protection for the Connecticut Attorney General’s Office. Represents a national developer of mixed-use luxury condominium projects, including a 440+ unit project in downtown Boston, advising on condominium documents and operational issues, and negotiating sales documents and service contracts. Represented a national life sciences REIT in the leasing of an 18,500 square foot laboratory and office space in Cambridge, Massachusetts. Represented a regional franchise in its repurchase of multiple franchise locations, including drafting and negotiating conveyancing and leasing documents. Represented a major pharmaceutical company in due diligence for a $1b+ manufacturing facility, including analyzing zoning and permitting issues and assisted in obtaining state and federal tax credits for the project, including a Letter of Support from the MA Secretary of Economic Development. Maker’s Mark v. Diageo: How Jose Cuervo Made its Mark with the Infamous Dripping Red Wax Seal, e15 Tul. J. Tech. & Intell. Prop. Jillian is interested in philosophy and is an accomplished diver. In her free time, she enjoys traveling, reading, and cheering for the Red Sox.